Aluminium is not only a versatile but also a malleable metal that is known to man and has extensive applications in industrial and domestic areas. The reason brazing is preferred here is firstly as against welding, it does need the metals to totally melt away. On the other hand, it differs from soldering by not applying unnecessarily high temperatures, which might play havoc with the metal properties. Brazing simply employs capillary action and a filler material to join two corresponding materials. People looking for every day applications will be happy to know that aluminium brazing can easily help you in repairing holes, cracks and leaks in aluminium which you will find in your air-conditioning system. In order to join metals like aluminium, you will need good brazing aluminium skills. This is why we are here to show you some of the tricks you might need in your repertoire to get the job done. The first point of action for you here will be to get rid of any kind of contaminants which might cause hindrance with the brazing process. The most common kind of contaminants that you are slated to encounter here are dirt, grease and oil. The best thing to do here is find a good degreasing aqueous solution which will simply remove all kind of dirt. But if you have any alloys of aluminium which are heat treated, then it will need a different kind of treatment. Here you have to either go for manual or chemical cleaning, which albeit not complex but can take some time. For this purpose you may need sandpaper which will assist you removing the oxides properly. A crucial aspect of the entire brazing process is to check whether the right filler metals are used. Firstly, you will need to find whether it is the aluminium or alloys made of it that are to be joined. In either case you will have the option for using commercial filler materials which you can easily get a hold of. The most common materials used for aluminium brazing purposes are shim stock or wires. Now there are a number of methods to get the filler metal in between the base metals which you can employ but it is always advisable you choose based on the overall need of the end product. As you know flux is very important to any brazing process, especially in aluminium brazing which is why you will need to exercise extra caution while choosing the right one for the job. You will see that most of the flux combinations used in the aluminium brazing process will include the likes of chlorides and fluorides which are usually in the form of powders. In order to get the pasty consistency of the flux, you will need to mix such powder with water and Voila!! It’s ready. After such flux is prepared, all that is left to do is to either flow it or spray it on the metals as well as the brazing filler material. Remember that some of the fluxes which are used for furnace or torch brazing can be a little too active, hence, be extra careful using them here because aluminium is really thin texture wise and may not react well on application of such flux. The parts of the products can be of any design and when it comes to thin materials like aluminium, this possibility increases tenfold, thus, increasing the chances of having a much complex design. This is something which can cause issues with the assembly and brazing process as the materials may go out of alignment. Therefore, employing good fixtures here is the need of the hour and the ones which can be perfect here includes the likes of inconel springs and stainless steel. Not only do they help in the alignment of the assembly but they also look after the expansions. The preferred choice of fixture here will be in the region of stainless steel or mild steel. The brazing process includes the application of heat as well as flowing of the filler materials. So for the first part, the heat can be applied on the entire body of the metals, but it depends on the size of the assembly. Although, there is one thing that should be kept in mind and that is to never apply heat on the joints of the assembly. As the brazing process is dependent on the capillary action therefore, applying heat around the joint area should be the most likely option to be used by you. 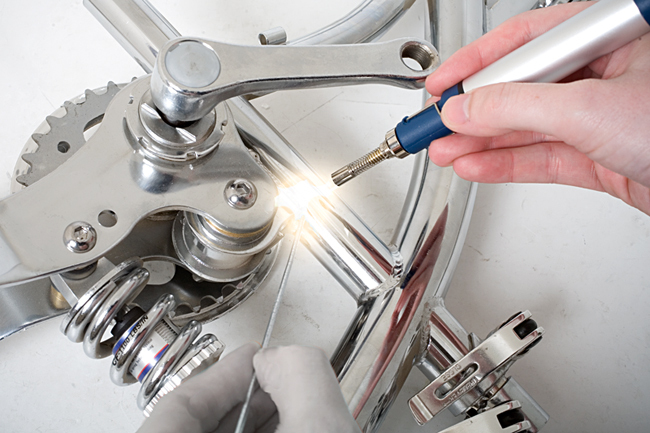 Cleaning of the brazed assemblies is an important and the last step in the brazing process. Here, removing the flux should be your primary focus, a goal that can be achieved by putting the brazed assemblies in boiling water. Any acidic element will be removed by a thorough water rinse. You can also apply the combination of nitric acid and hydrofluoric acid in proper proportion to get rid of the flux and other impurities.